Swim Meet Prep Sheet - Website of seanmclark! With a swim meet coming up, I put together a list of some of the key things for new swimmers--both young and old--to think about. Racing isn't the most important thing for everyone, but I've never met an athlete who didn't want to perform their best once the whistle sounded. With a little bit of preparation, you can make the odds of that happening a lot more likely. I've broken the advice into five major sections. Let me know what I've missed! There’s nothing you can do to better prepare for a swim meet than get as much sleep as possible in the week before. The closer you get to a swim meet, the more you should be practicing starts and turns. Think of each length as an opportunity to push off from the wall further and faster. If you have mentally rehearsed what you are going to do, you’re less likely to succumb to nerves and anxiety. Count your strokes at practice, then before you go to bed a couple of nights before the big meet, visualize each stroke and turn of each race you plan to swim. Make sure you eat lots of carbohydrates in the days before. These include grains, rice, vegetables, and fruits. Stay well hydrated throughout the week. Bring a water bottle to class (actually a good piece of advice for all phases of training). Success in swimming rarely happens in leaps and bounds. Try instead to achieve small improvements each practice and race. Decide beforehand what small steps you want to achieve and focus on making that a reality. Not only are such small, incremental goals practical, they build up over time into GREAT things. Both the suit you’re going to race in (not a drag suit or anything else specifically used for training) and a back-up. Suit malfunctions are neither unheard of nor something easily fixed! You’ll likely want to race with a pair that is different from the one you practice in—that way you can make them much tighter (so they won’t leak or fall off during a start), but not have to deal with the discomfort for an entire workout. Be sure to try out your racing pair using the blocks before racing. 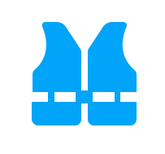 Keeping the strap high on your head will help prevent them from falling off. Bring a back-up pair as well. A snapped goggle strap has ruined many a swimmer’s day. If you use them, bring two—the latex ones in particular will rip over time. Many racers now wear two caps to race anyways: a latex cap to hold their hair and goggles in place, and a silicone cap over top because of its increased streamline efficiency. If you’re comfortable with this method, make sure you bring a backup for each. Fill it up (with water) and USE IT. Remember that if you are thirsty, you’re already dehydrated. A second towel isn’t necessary, but can come in handy after a long day at the pool. Make sure you have a warm pair of pants and a sweater to wear on deck. These will get wet, so make sure you have an extra pair of dry clothes to wear home as well. Sandals or indoor shoes will prevent injury and help keep your feet warm. If the meet is expected to run a full morning or afternoon, bring a banana or some low fat yoghurt. This will provide a bit of energy if the session starts to wear on. Viewing space may be tight, so if you want to make sure you have a seat, bring a camp chair for each athlete and parent/spectator. Blankets can do the job as well (they can also help a swimmer keep warm), though they are usually more appropriate for outdoor meets. Heat sheets details, event by event, which athlete races in which heat and lane. Highlight your races and those of your friends. Heat sheets are also a great place to record your splits and times. A heat is the name for the group of swimmers that all swim at the same time. In an eight-lane pool, you would have eight swimmers racing together in a heat—provided all the lanes were full. 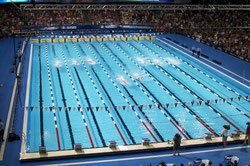 An event is made up of all the heats, with everyone in that event swimming the same distance, stroke, and being in the same gender and age categories. Meets are often divided into a morning or preliminary session, where swimmers try and qualify for the finals session, usually held at night. Usually the top 8 swimmers for each event make a final and the top 9-16 swimmers qualify for a consolation final. There is usually a break of four or five hours in between the two sessions, so athletes have time to digest a good meal and get some additional sleep. Depending on how many events you swim, a big meet will have a lot of sitting and waiting for your races. Some athletes (and parents) like to relax by reading or doing word puzzles; others prefer to listen to music. Use whatever keeps you calm and ready before the big race! Swim meets may vary slightly from one location or level of competition to the next, but the basic pattern is standard anywhere you go—worldwide! Each day, before any races happen, athletes get a warmup hour to swim some easy laps. This swimming gets the blood flowing and adrenalin pumping—it literally warms the body up. Most swimmers put in only a half hour or so (around 500-1500m), followed by a few starts and 15m sprints. Be aware that the water will be COLD. The international swimming federation (FINA) recommends meets be held in water as cold as 77 degrees Fahrenheit. That’s quite a bit colder than the 81-82 degree pool you swim in during regular workouts. Music will blare over the loudspeakers during warmup. This helps the athletes and crowd get amped up for the racing. ‘Thunderstruck’ by the Australian band AC/DC is almost certain to be played. See your coach before every race. Together you will plan out how best to attack the upcoming swim. The race plan may include things like stroke technique and breathing strategy. You will also talk about race splits, or how fast you want each 50m to be. Generally the idea is to go out strong but controlled, maintain your pace through the middle of the race, then come home in the last 50m as hard as you can. Heat sheets outline the organization for the entire meet. Follow the heat sheet until one event before your next race. At that time, head to marshalling, the place where all the swimmers are lined up before they go behind the blocks and get ready to race. Some meets will have race cards, which the marshal gives to each swimmer to hand to the timer behind the blocks. This was common practice in the early days, but is less so now. The marshal will tell you when to leave the marshalling area and go behind the blocks. When you get there, hand your card (if you were given one) to the timers (there will be 1-3 timers for each lane). While you’re waiting for the heat ahead to finish their race, make sure you stretch and swing your arms. Now is the time to get your blood pumping. Make sure your cap and goggles are ready to go. Only take off your warm clothes right before the heat finishes—you don’t want to be waiting behind the blocks during a 400m race, freezing. Wait until the last 50m or so. Once the heat ahead has finished and the timers have sat back down, make your way to the blocks—but don’t get on the blocks (or jump into the water, if you’re swimming backstroke) until the referee blows her whistle. With the referee’s (long!) whistle you climb on the blocks (or, again, jump into the water if you’re doing backstroke). Do this fast enough that you’re not slowing down the meet, but don’t rush yourself either. Once everyone is on the blocks, the referee will blow a short whistle, handing over the start to the Starter. The Starter will command ‘take your mark’, and athletes will move to their ready position, grabbing the blocks and tensing for the big start. Traditionally the Starter would signal the race start with a special pistol designed to make noise (rather than fire bullets). With the advent of electronic timing, the signal now is an electronic beep accompanied by a light flash. The Starter will only give the signal when all the athletes are standing still. If the athletes keep moving he will command ‘step down’ and everyone will have to start again. The Starter will fire the gun a second time if someone leaves early. This is a false start, and will result in everyone coming back and the race starting again. Depending on the meet rules, the swimmer who false started may be immediately disqualified. Officials will patrol the sidelines and the bulkhead, watching for one-handed turns, pulling on the lane rope, swimmers leaving early during relays, and other rule violations. If you’ve been disqualified (or ‘DQ’d’) they will let you know when you finish. This is extremely disappointing after you’ve worked so hard during the race, so make sure your turns are crisp and you follow the rules closely. Once you’ve touched the wall to finish the race, wait into the water until after the next race starts (unless you are swimming backstroke events, where the officials will have you get out of the water before the next heat begins). Make sure you don’t get out of the water too early—you could interfere with the Starter’s commands to the next heat. Just as importantly, it is polite to wait until the last swimmer finishes—not everyone is as good a swimmer as you! It’s important to see your coach immediately after you finish your race. She will want to talk about how successful the race plan was. You two will discuss all the things that went well, and talk about what can be improved for next time. Depending on how many swimmers are racing at the same time, your coach will try to record your race splits. These are useful indications of what part of your race can be improved—and show you where fatigue really began to set in. After the race is over the timers will write your times on the card and hand it over to the officials in charge of recording the results. If an electronic timing system is being used, the official results will almost always go with that—unless there is technical problem preventing the electronics from working as they should. If electronic timing is not used, your official time will be the middle of the three times recorded by the human timers, to ensure fairness. Once all the times are processed the results will be posted on a designated wall. They will also make their way to the club’s website (and, if a sanctioned meet, to Swim Canada’s national database). 5. Make sure you do some recovery/warm down, done at low intensity (<35% VO2 Max) to avoid reducing glycogen stored in fast twitch muscles. Make sure you take food w/within 30-60min of exercise--muscles are like a sponge: soak up quickly, but if they dry out, it takes much longer. There are a few basic rules all swimmers need to follow when racing. The Stroke and Turn Judge will be on the look-out for infractions. Stand on the bottom of the pool during a race. Pull yourself along the lane lines or side of the pool. Swim more than 15 meters without coming up for a breath. You can do anything but the above. Swim on your stomach – except for one arm stroke while starting a turn. The turn push off is on the back. Finish the race and touch the wall on your back. Backstroke starts from in the water with the feet below the surface on the pool wall. Kick with both legs together – no flutter or breaststroke kicks. Swim on your stomach with both arms moving together. The arm stroke recovery must be out of the water. Never take an all underwater breaststroke pull and recovery. Touch the wall with both hands on the wall for turns and finishes. Each stroke cycle—including after the start and turns—must begin with a pull followed by a kick. Your arms must pull together while your elbows remain underwater. Your head must break the water surface during each stroke cycle. Except for the first arm pull after the start and turns, your hands must not pull beyond the hips. At the start and turns the first underwater pull is all the way back to your legs. This is a pullout. A proper breaststroke kick is when the toes point out to the side. Push water with the foot’s side or bottom. Do a dolphin kick only during the pullout. Touch the wall with both hands on the turns and finish of a race. The order of strokes is butterfly, backstroke, breaststroke, and freestyle. Each stroke must be swam in accordance with its stroke and finish rules. This means the butterfly to backstroke turn requires a two hand touch and a push off on your back. The backstroke to breaststroke turn must be started on your back and finished on your stomach. The breaststroke to freestyle turn requires a two-hand level touch. The stroke order is backstroke, breaststroke, butterfly, and freestyle. Swimmers after the first one must have a part of their body (think feet!) on the starting block when the previous one finishes. The backstroke swimmer starts in the water. 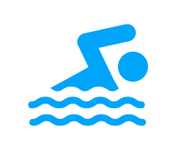 The freestyle swimmer cannot swim backstroke, butterfly, or breaststroke. “Step up” means get on the block and remain standing or “Enter the water” is for backstroke. “Take your mark” means get into starting position and do not move. 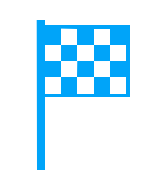 If you or any swimmer is moving the race starter will stop the command sequence and restart it. The final command is a loud sound. If the swimmer leaves the block before the start command it is a false start. The race is restarted. The swimmer may be disqualified. Wear heavy, dry layers right up until you go behind the blocks to race. Your body loses energy when it shivers, so you want to limit that as much as possible. The combination of good hydration and nerves mean you can never make too many trips to the bathroom. Just make sure this is WELL before you are supposed to race—many an athlete has missed their race because they were in the bathroom. You should have plenty of downtime at a swim meet. Use this time to do some active stretching before your races. Start from your head and work all the way down to your feet. Gently rotate all of your major joints (neck, shoulders, elbows, hips, ankles, bring you knees to your chest, etc). Stretching will increase joint range (and therefore allow longer and more efficient strokes), enables more force generation, improves circulation to your muscles, and promotes relaxation. All of these are key ingredients for speed! You will be TIRED by the end of your race. You will be out of breath and your muscles will be shouting at you to stop. The fatigue means swimmers just glide into the wall at the finish. You must resist this temptation and keep going strong all the way until you touch the wall. One way to make sure you do is to put your head down for the last few strokes, take no breaths, and focus on kicking as hard as you can. Swimming is a sport of inches, and this final push can make all the difference! A fast start off the blocks and a good, streamlined breakout to the water’s surface is a good way to put yourself in control of a race. Plus, you stay out of everyone else’s wake! If things don’t go perfect off the start, don’t worry. There is still usually time in a race to come back. Don’t be too discouraged. Swimming fast is about swimming smart: turn efficiency is one of the best ways to save energy. A few bonus meters each length can make a huge difference to the final results. Make sure you have clean turns (strong push-offs, fast tumbles, no hanging on the wall, etc) and keep your streamlines tight. Just like with your starts, try not to breathe for the first 2-3 strokes (freestyle and butterfly). This will help you maintain your speed off the wall, rather than lose it as your body pauses ever-so-slightly to breathe. Here again, load up on carbs after each session. Your body needs fuel to swim fast. So relax! Why worry about one single race now, when you could easily swim dozens or even hundreds of races over the next half century? This meet is just one step in a lifelong activity. Sports are about building character and improving your physical condition. But they’re also about having a good time. Never ignore the first two, but always make sure you have a good dose of the third as well. 6. Ivy et al 1988.